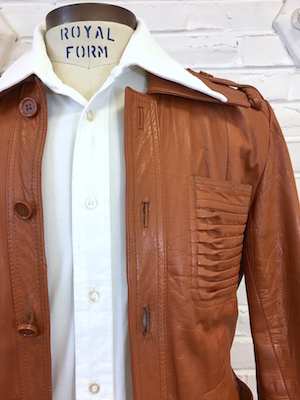 (38) Mens Vintage 70s Leather Jacket! Burnt Orange! Fancy Folds, Matching Belt & Epaulets! 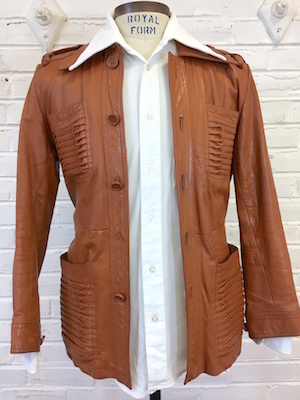 Home > Items just added 4/3-4/17 > (38) Mens Vintage 70s Leather Jacket! Burnt Orange! Fancy Folds, Matching Belt & Epaulets! 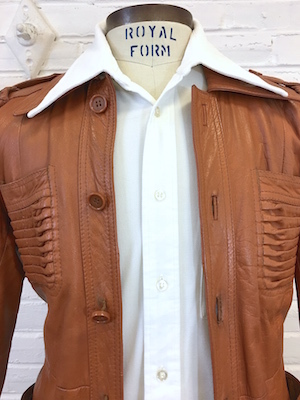 Wonderful vintage 1970's mens leather jacket. The colour was tough to photo- its orange, but not neon- more like burnt pumpkin. Has these very cool "pleats" (accordian-like folds) on the 4 front pockets and down the back. Really cool detail! Matching buttons down the front and on the 2 shoulder epaulets. Has a matching braid under the epaulets. Longer 70s collar. Original matching belt. Made by Neiloport Kingdom of Fashion. KILLER coat!! Insurance included in shipping cost. Condition: Very Good except missing the 2nd from bottom button. Has been conditioned but could use a good leather cleaning as it has some darker areas. Chest: 38" marked a 40 but measures smaller.